Contemplate the largest Menhir in the Iberian Peninsula, located in Castelo de Vide, Portugal. 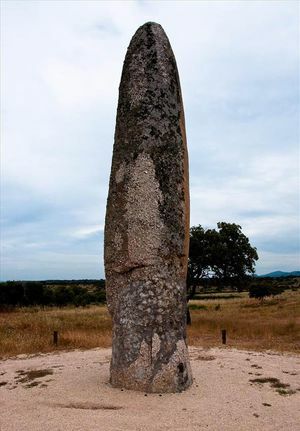 The parish of Povoa e Meadas, in Castelo de Vide, Alentejo, boasts of hosting the largest Menhir in the Iberian Peninsula. It is a huge monolith more than 7 metres high, weighting 18 tons. This amazing menhir was sectioned and demolished until 1993, when it was restored. Reputedly, its height is due to the fact that it belonged to a line of standing stones carefully organised, so that each one of them would be visible from the next. The Meada Menhir was the shortest one of all.